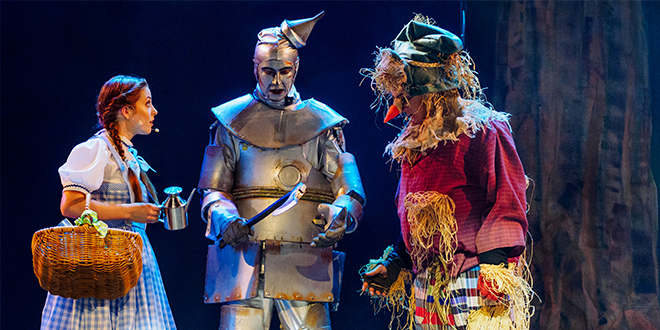 Tin Man’s troubles: Dorothy, the Tin Man and the Scarecrow discuss their important mission into the Emerald City for a production of The Wizard of Oz at Emmaus College, Rockhampton. DOROTHY and Toto were a long way from Kansas for the sold-out production of The Wizard of Oz at Emmaus College, Rockhampton. More than 100 Emmaus students were involved in the cast, crew, orchestra and costumes in a 14-week preparation for the production on July 27-29 at the Pilbeam Theatre. But one role was decidedly recruited from outside the school body – Toto. School career advisor Narelle Sommerfield’s 13-year-old dog Toby stole the show as Dorothy’s dog. The production’s director Joy Philippi said the school productions were an entire community event. “Every single person that puts in the smallest amount of effort brings this production together,” she said. Ms Philippi said the annual production, which was in its 34th year, was a tradition that the community looked forward to each year. “Our annual productions are a professional environment where students are given the opportunity to understand what it is truly like,” she said. But there was always a strong focus on respect too. “Everyone is always welcome to be a part of each year’s production whether they wish to develop new skills or just practice our college values like commitment and community,” Ms Philippi said. “The team of staff, parents, ex-students, family and Emmaus friends is large in number, and their dedication and commitment, no matter how small or big, is what makes the production a big part of the Emmaus mission. The importance of the production was highlighted in the production prayer. The prayer highlighted the importance of thanksgiving and growing. “Let’s not wait until it’s over to notice what we have here now,” the prayer read. “Don’t take any of it for granted, for ‘there really is no place like home’.